In Saint Matthew’s Academy we are committed to a vision which is rooted in the Charter for Catholic Schools in Scotland. Pupils, parents, staff and partners have been involved in establishing our vision and values. By ensuring we are challenging and ambitious we seek to present a vision which reflects the needs and aspirations of our Community of Faith and Learning. Our vision for Saint Matthew’s Academy is one of a community of faith and learning dedicated to Gospel Values. We work together to ensure the effective formation and development of the whole child by providing the highest quality of education. We strive to ensure our young people develop their talents and abilities in order to best support the common good. 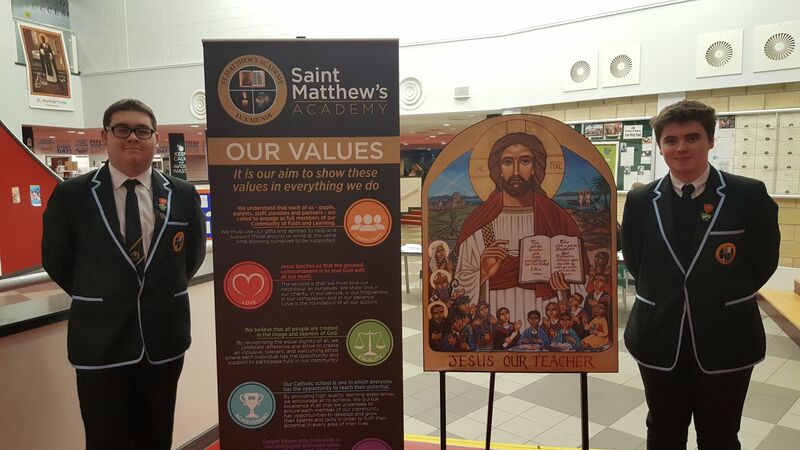 Our values underpin our ethos within Saint Matthew’s Academy. They are CLEAR and we strive to ensure they are visible throughout our school. Community – we understand that each of us – pupils, parents, staff, parishes and partners – are called to engage as full members of our Community of Faith and Learning. We must use our gifts and abilities to help and support those around us while at the same time allowing ourselves to be supported. Love – Jesus teaches us that the greatest commandment is to love God with all our heart. The second is that we must love our neighbour as ourselves. We show love in our charity, in our service, in our forgiveness, in our compassion and in our patience. Love is the foundation of all our actions. Equality – we believe that all people are created in the image and likeness of God. By recognising the equal dignity of all, we celebrate difference and strive to create an inclusive, tolerant and welcoming ethos where each individual has the opportunity and support to participate fully in our community. Achievement – our Catholic school is one in which everyone has the opportunity to reach their potential. By providing high quality learning experiences we encourage all to achieve. We pursue excellence in all that we undertake to ensure each member of our community has opportunities to develop and grow their talents and skills in order to fulfil their potential in every area of their lives. Respect – Gospel Values only truly exist in our interaction with each other and with the world around us. By ensuring that all relationships are built on a mutual and genuine respect we create a Community of Faith and Learning where all can attain their full potential. We have respect for others and for ourselves as we understand and greatly value the gift of life we have been given. to provide opportunities for the personal and professional development of staff.